Do you use a computer or digital device more than two hours per day? Do you suffer from dry or tired eyes, head, neck or back pain during these activities? If so, you may be suffering from Digital Eye Strain. 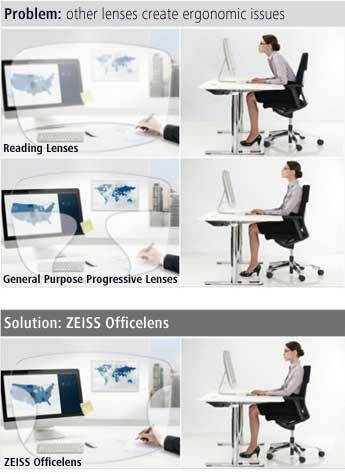 Now there is an eyeglass lens at your McKinney, TX eye doctor that can help your eyes stay comfortable at a computer and in other up-close activities: ZEISS Officelens. The right tool for the task at Texas State Optical McKinney. Reading Lenses offer no intermediate vision. Result: Wearers lean in toward the screen to see clearly, creating an unnecessary strain to neck and back. General-purpose Progressive Lenses offer a narrow intermediate located below eye level. Result: Wearers lift their heads to view the screen, causing a strained neck and shoulder muscles. Put an end to Digital Eye Strain and get clear, relaxed vision all day long. 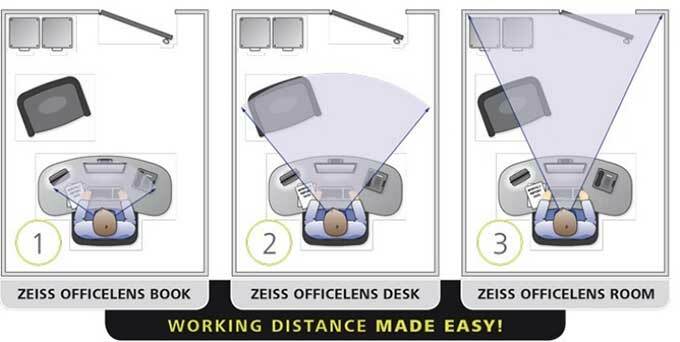 Ask your eye doctor at TSO McKinney about ZEISS Officelens today.